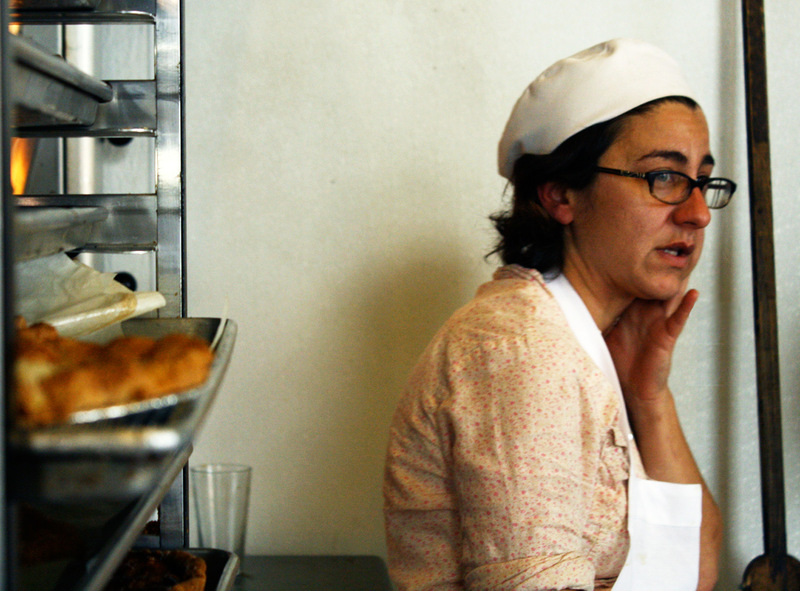 Mission Pie partner, Krystin Rubin, contemplates the number of pies her shop needs to make before the start of the holidays. At first the idea was simple: cook food, sell it, make money. For years this has been the underlying premise of running any restaurant. But recently, a handful of food entrepreneurs across the country — and particularly some concentrated in the Mission — have come along to turn that model on its head. Some donate proceeds to local charities. Others use cafes as places to teach neighborhood youth about the work ethic and responsibility. Others don’t even charge for their food, letting their customers pay only what they want to or can. All have one thing in common, however: They believe that making a profit means more than simply earning money. Opened nearly four years ago, Mission Pie is more than an average neighborhood pie shop. One of its core missions is to teach disadvantaged kids from the Mission what it means to hold down a job. Supported by local nonprofit organizations, high school students work at the pie shop as interns for three months, learning everything from baking to basics like punctuality and customer service. But as Rubin is quick to explain, their currencies are also valued in other terms. In part, it’s how positive and empowering a place they can establish in a neighborhood that, despite its rapid change in the past decade, is still home to low-income households and people with inadequate life skills. Satisfaction for Rubin comes in the form of seeing people change in such short periods of time. Places like the newly opened bakery co-op Arizmendi, on Valencia Street, and nonprofit food business incubator La Cocina have built models around offering opportunities for the disenfranchised. Denise Cerreta, however, seems to have created an entire movement out of do-good restaurants. She is the woman behind One World Everybody Eats, a network of cafes and community kitchens around the country that offer similar workplace training, but also let customers price their own meals. When a customer walked in through the door one day, without explanation she simply told them was no set price, and to pay whatever they thought the food merited. She built a pay-as-you-please model into the normal operation of the shop, and watched the customers come flowing in. Over the course of time, Cerreta found that many were even willing to pay more than suggested prices. (Suggested prices for bowls of soup may be $2, and entrees like pasta or salmon could go for $6 or $8.) But as the economy began to crash, so did the amounts people paid. Cerreta isn’t worried, though. Now more than ever, places like her café need to exist, according to her, because people can’t afford to pay what they used to. There are now nine similar cafes operating throughout the country, and 50 others in various stages of development, according to Cerreta. Even the national chain Panera Bread, inspired by Cerreta’s cafes, opened a pay-as-you-please bakery in St. Louis earlier this year. It found the model successful enough to open a second location in Dearborn, Michigan, in November, and is currently developing a third location in Portland, Oregon. Models like these operate with what’s called a triple-bottom-line principle. Coined by writer Freer Spreckley in 1981, it is now the mantra of progressive MBA programs throughout the United States. It defines the success of a business beyond traditional financial measures, looking at companies more holistically, including in terms of its environmental and social impact. “In the food industry, there’s an overwhelmingly pervasive movement to have things be socially conscious,” says Anthony Myint, the entrepreneur behind Mission Chinese Food and the recently opened Commonwealth, restaurant at Mission and 18th streets. Both were started with the idea of giving a portion of proceeds to local charities, such as the San Francisco Food Bank and Meals on Wheels. While Myint admits that the charitable component of Commonwealth hasn’t been as successful as he’d hoped — $10 of every $60 tasting menu is given to charity, but only 10 percent of diners have ordered it so far — he has hopes that the model will grow. Since opening in August, Commonwealth has raised roughly $7,000 for charity. Mission Chinese Food, located a few storefronts down on Mission Street, has raised $12,000 since July, which amounts to approximately seven percent of sales. Myint sees a demand for these types of restaurant in the Mission, which has a confluence of fine dining and a community of people predisposed to social consciousness. If the amount of money the community helped raise to open Commonwealth is any indicator, he might have a point. Commonwealth crowdsourced part of its startup funding, with 141 people contributing more than $12,500 to help the charitable restaurant get off the ground.